Google reported its earnings for Q2 2012, with its quarterly revenue growing to $12.2 billion. Of that, nearly $1.25 billion was due to its acquisition of Motorola, while organic growth contributed nearly 21% growth. Its overall gross margins also took a hit following the Motorola acquisition, due to much higher relative cost of revenues for the hardware business. Google’s operating income was nearly $3.2 billion and its net income was around $2.8 billion. Of the $12.2 billion, advertising revenue from its own website was close to $7.5 billion, while ad revenue from its network was about $3 billion. 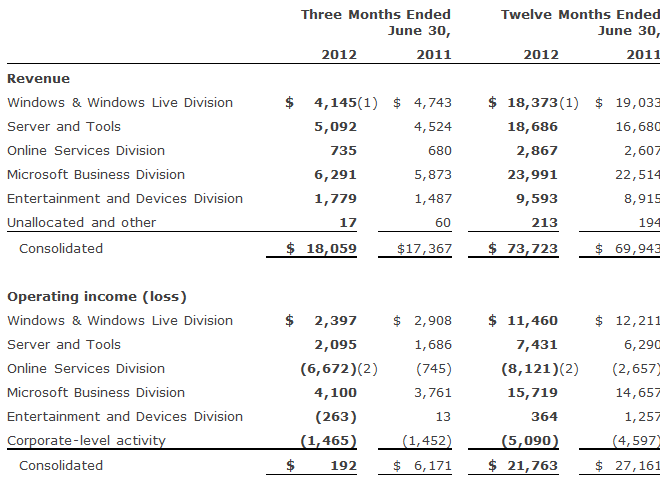 Other revenues added up to $0.44 billion, while revenue from Motorola added up to $1.25 billion. There weren’t many surprises this earnings season; Google’s aggregate paid clicks increased 42% this quarter, while its cost-per-click declined nearly 16%. Both changes can be attributed to the increasing penetration of mobile devices and mobile search. Traffic acquisition costs, or the portion of ad revenue shared with partners, increased from 24% of revenue to 25%. Interestingly, Google’s cash reserves have ballooned up to almost $43 billion. Microsoft has reported its earnings for Q2 2012 (Q4 FY12) and while it continues to see steady revenue growth with revenue rising to $18.06 billion, it has reported its first loss ever ($492 million), primarily due to an non-cash goodwill writedown it took due to its failed acquisition of aQuantive in 2007. If we adjust for the impact of the writedown, Microsoft would have reported a profit of more than $5 billion. As expected the Business (Office and Enterprise) division posted revenue of $6.29 billion, up 7% year-over-year, while the Server & Tools business posted revenue of $5.09 billion, up 13%. The Windows division saw a 1% decline in revenue to $4.15 billion, as Microsoft decided to defer revenue from its Windows 8 upgrade offer to the next quarter. Entertainment & Devices continued to grow the most, with revenue increasing to $1.79 billion, up 20% year-over-year. Online Services, as usual, continued to be a disappointment, and posted a modest increase in revenue but a massive operating loss, thanks to aQuantive and Microsoft’s other failed endeavors. The next couple of quarters are going to be very crucial for Microsoft. Sales should be driven primarily by the launch of Windows 8 and Office 15. We also expect Entertainment and Devices revenue to be boosted by sales of the Surface tablets, and the expected launch of the next Xbox sometime in the next year.